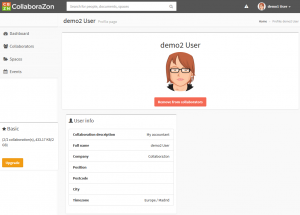 Registration – How to register Collaboration and File Sharing account with CollaboraZon? To register a new user click on the link ‘Register‘ on the Login page. 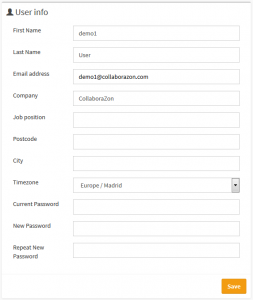 A simple form will open asking for basic information to create your profile. Your email address will be your login when entering in the application. The language used in the registration will be stored in your profile and will be the language used in the application for your user. After clicking ‘Create my account’ you will receive an email to verify your email, click on the link and you will be redirected to the Login page again and your account will be completed. The email for verification of your email address expires after some time. If you forgot to verify during this time, you can always ask the application to send you a new one clicking on ‘Resend activation email’ (see previous image). If you forgot your password, just click on ‘Forgot password’ and the application will ask you for your email address and it will send you a new one. Do not forget to change it after login (see previous image). To sign in go to the Login page and enter your validated email and password (see previous image). If correct, you will be redirected to the Dashboard page. If you want your computer to remember you and sign you in automatically next time you visit the site, tick the box ‘Remember me’ before login. 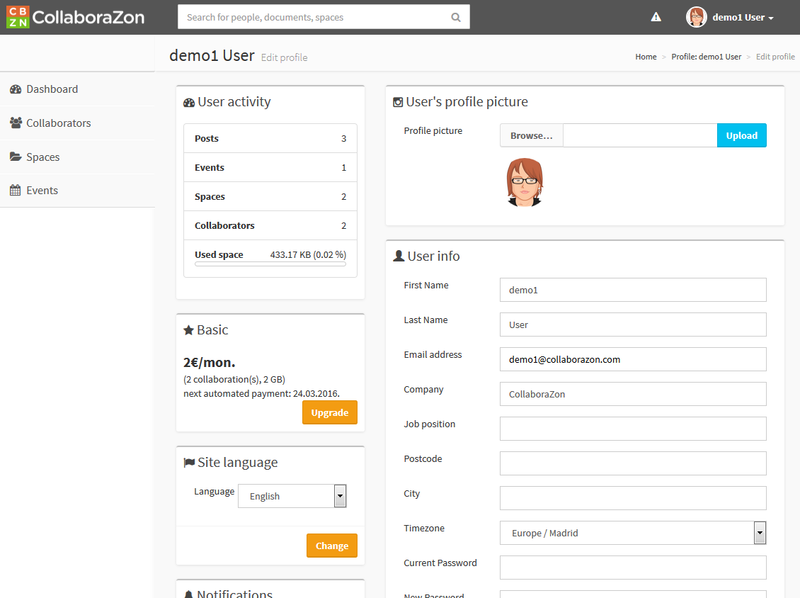 The first time you sign in you will land on the Dashboard page. This page is the main page where you will see all your conversations and events for the current month. 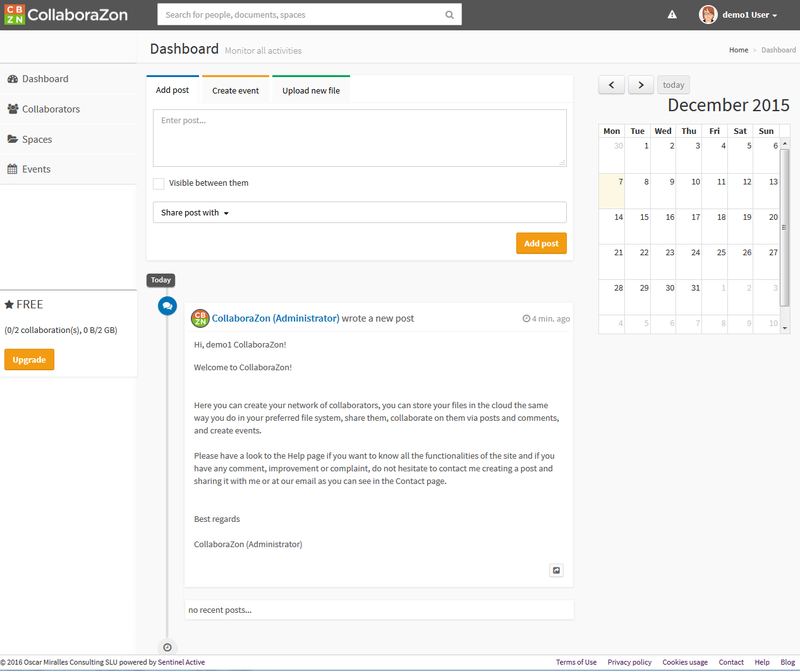 First time you will see your first post from the CollaboraZon Administrator welcoming you to the application. 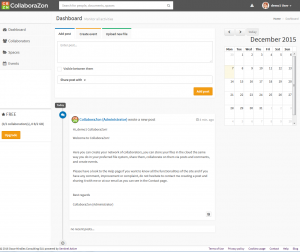 You cannot comment on this post, but you can create a new one, whenever you want, sharing it with the CollaboraZon Administrator to discuss directly with him whatever doubts, new ideas or problems you may have. When you are done working in the site you can leave by clicking on the link on your user name on the top bar and then on the button ‘Sign out’ in the dropdown menu, this will log you off the application and send you to the homepage of the site. Once you have created an account you can view your profile details. To do so, click on the link on your user name on the top bar and then on the button ‘Profile’ in the dropdown menu (see previous image). This will take you to your profile page. 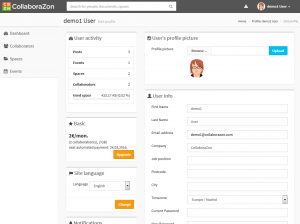 Here you will be able to see your personal details, your subscription plan, your notifications’ configuration and some statistics on your user activity (drive space used, number of collaborators, etc). See user activity: In the panel ‘User activity’ you can see how many posts, spaces, collaborators and used space you have. Change your personal details: In the panel ‘User info’ you can change your personal details and password. Upload a profile picture: In the panel ‘User’s profile picture’ you can upload a picture for your profile. 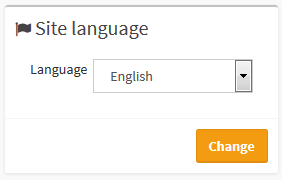 Change your language: In the panel ‘Site language’ you will be able to select from a list of available languages. Once selected the site will be translated and all the notifications will be received in that language. Cancel your account: In the panel ‘Cancel account’ you will be able to cancel your account completely. You are warned to download all your files before cancelling as they will be removed from the cloud storage. Your posts and comments will be kept as they could be important for a conversation, but your name will appear strike through. Your events are kept as well. 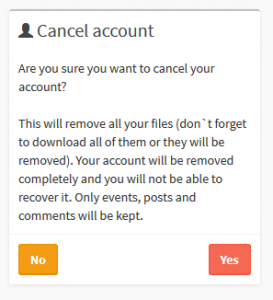 Your account will not be recoverable, if you want to use the system again you will be obliged to create a new account (you can use the same email as this one will be removed from our database when you cancel). You will be notified always of any actions done in your profile, events, posts, comments, spaces and files, of your own or shared with you. Notifications will be shown on screen in the top bar and also you will receive emails. As said the before, emails can be disabled to avoid spam. Search: Use the search box on the top bar. Type at least 3 letters and the results matching your request will appear in the dropdown list. If the person you are looking for is already a user of the application appears on the list click on its name, this will show its profile page. Click on the button ‘Add to collaborators’ and a notification will be shown to him when login in the application (he can click on the notification to accept your invitation); furthermore an email will be sent to him (he can click on the link in the email to accept your invitation). Send invitation manually: If the person has not yet an account you can invite him by email. Go to the list of your collaborators clicking the option ‘Collaborators’ on the left menu bar. 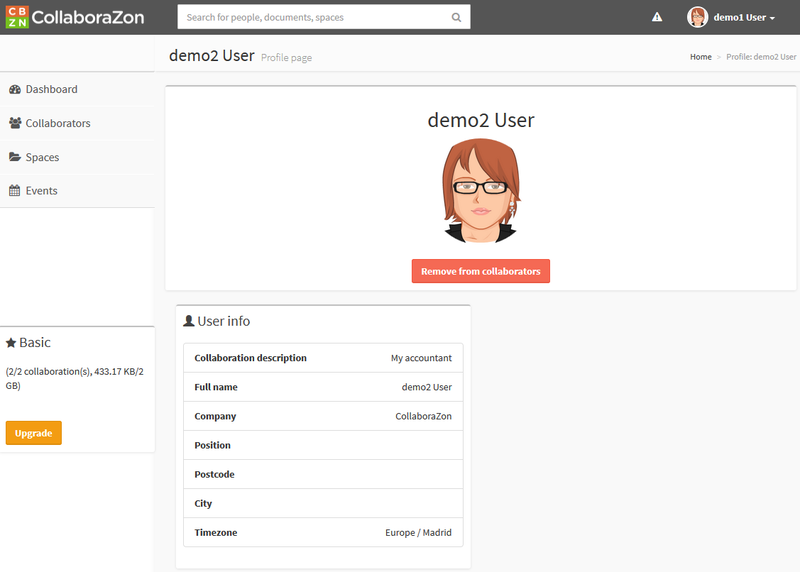 You will be redirected to the collaborators page where you can enter the email of that person in the box ‘Invite people’. An email will be sent to him (he can click on the link in the email to accept your invitation which will allow him to register in the application and start collaborating with you). You can always come back to the collaborators page to see the list of your collaborators and visit their profile pages. 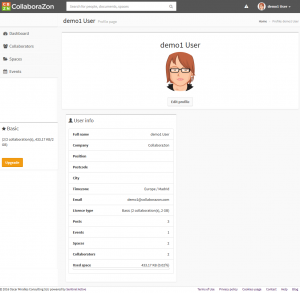 In this list apart from the collaborators you have invited you will see the CollaboraZon Administrator, this collaboration is created automatically the first time you register, it is impossible to remove this collaboration as it may be necessary to communicate with him. You can give a name to your collaboration with another person, this will make easier to recognise which is your relationship with him. Click on the ‘+’ (‘Add description’) link on the left of his name in the list, you can now introduce a description (i.e. my accountant). This description is personal, the collaborator will not see it, but he can enter a different one as his relationship with you could be different (i.e. my client). 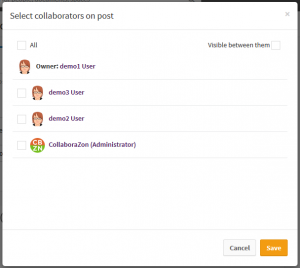 You can also at any time remove your collaboration with another person by clicking on the ‘x’ (‘Remove from list’) link on the left of his name in the list. 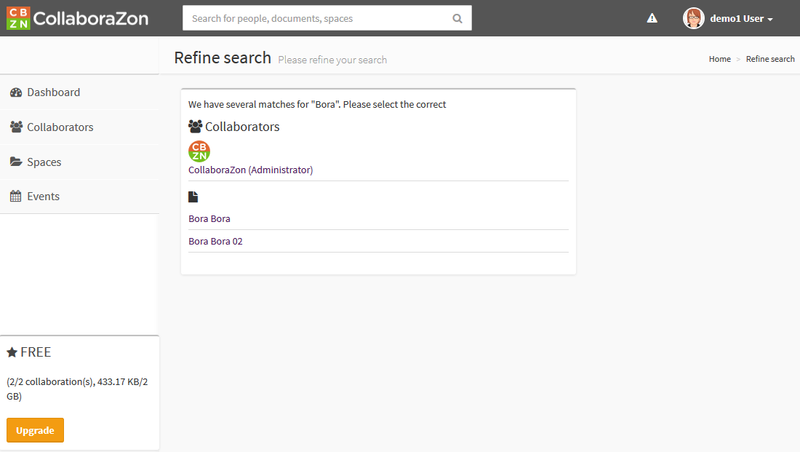 You can also filter the list to see only the collaborators matching your search, use the ‘Search’ box on top of the list. IMPORTANT: Remember the list of collaborators is limited by your subscription plan. If you raise the limit of your available collaborators you will not be able to add new ones unless you remove others or you upgrade the plan. 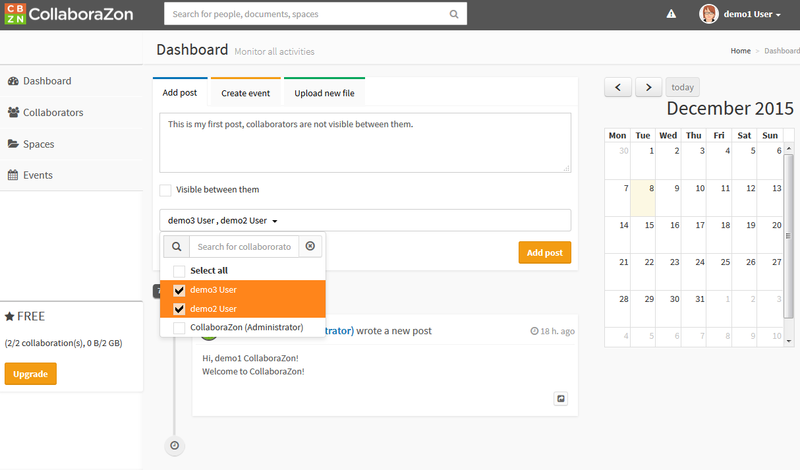 To do a search for collaborators, existing or new ones, as explained above you can use the search box in the top bar. If there are too many results, you can also click on the ‘Return’ key on the keyboard or the magnifier icon and you will be redirected to the Refine Search screen where you will see all, the results in a list. Clicking on one of the results will open the user profile. Once you have a network of collaborators you can start collaborating with them. 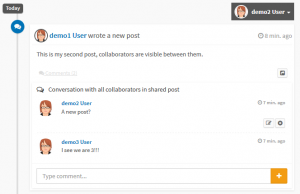 One possibility is to publish a post and share it with them, allowing them to comment it. To publish a post go to the Dashboard page and enter the text of your post in the ‘Add post’ tab. 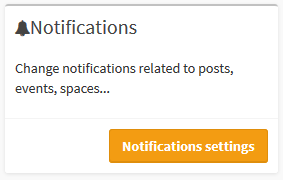 If you click on the ‘Add post’ button now the post will be private and only visible to you in the list of posts. 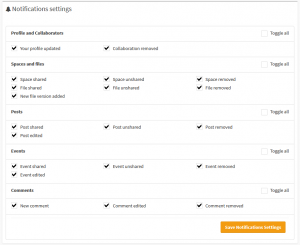 To share the post you can do it when creating it clicking on the ‘Share post with’ drop down list where you will see the list of your collaborators (including the CollaboraZon Administrator). 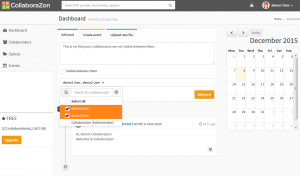 Tick the box next to the names of the collaborators to share and close the dropdown. 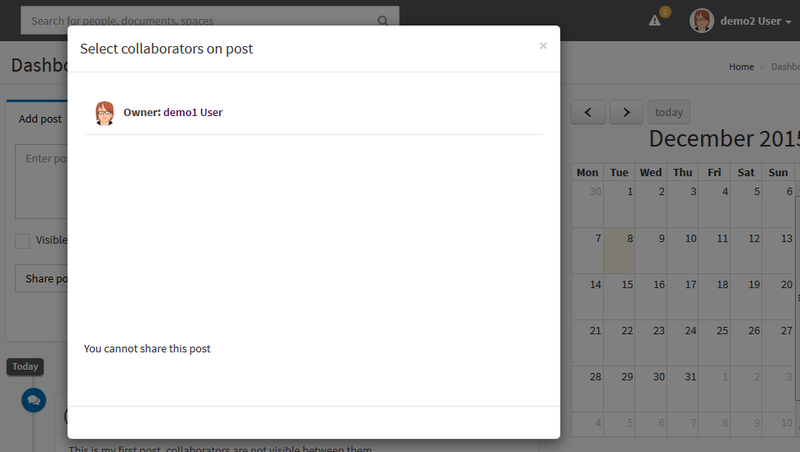 Another option is to click the ‘Share post’ button in the post already created and added to the list of posts. 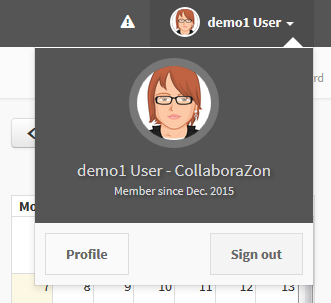 A modal window will appear with the list of your collaborators (those already collaborating will be already ticked). Sharing is only possible when you are the author of the post. 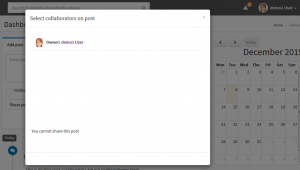 If you are the author of a post you will be able to modify the text of the post by clicking on the button ‘Edit post’ and re-writing the text. You are able to remove the post as well by clicking the button ‘Delete post’. If you are the author of a post or one of the collaborators sharing it, you will be able to comment on it. By default the comments on a post are minimised to save space. You can expand the list of comments by clicking on the ‘Comments (x)’ link and then on the ‘+’ link on your comments ‘Comments from [your name]’. 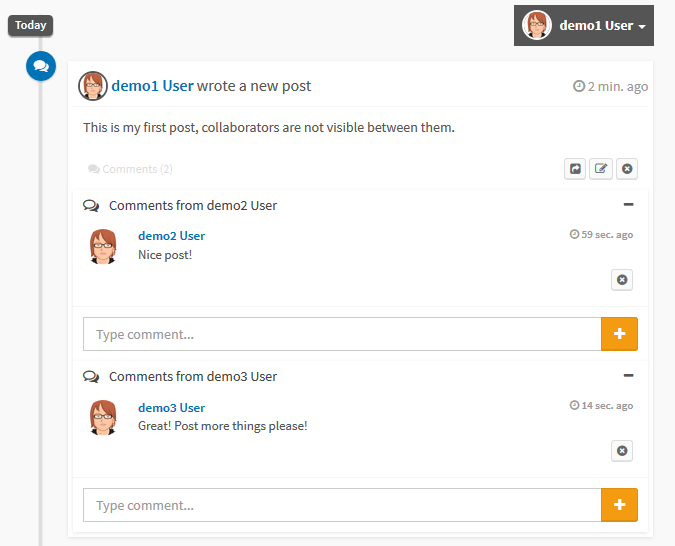 This will show all the comments of the post and an empty text box at the bottom where you can write your comment. Click ‘Return’ key on the keyboard or click on the ‘+’ button to add your comment. If you are the author of a comment you will be able to modify the text of the comment by clicking on the button ‘Edit comment’ and re-writing the text. You are able to remove the comment as well by clicking the button ‘Delete comment’. The list of posts can become long and finding the right one will be cumbersome. You can type a text in the ‘Search’ box on the top bar and the posts and comments containing the text will appear in the drop down results list. Click on one of the results and you will be redirected to the ‘Post’ in a separate page. If many similar posts and comments appear you can also click on the ‘Return’ key on the keyboard or the magnifier icon and you will be redirected to a page with the list of similar results. Chose the right one and you will be redirected to the post page. 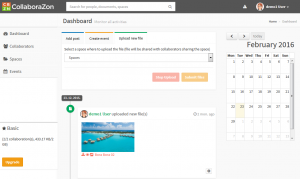 You can create events to remember deadlines on revision of documents or just for inviting people to meetings. 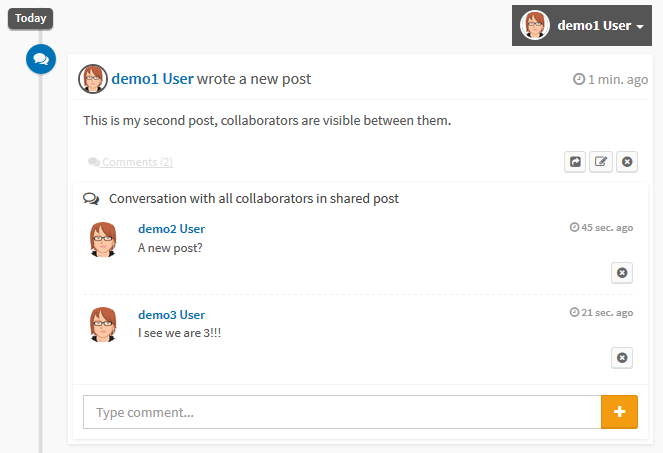 Events can be shared with collaborators the same way posts do. Events have a date and a time, a reminder email and notification will be send the same day of one or more events are expected to happen, around 1:00am. There will be only one event email with the list of events due that date. Also 30min before an event another reminder email will be sent. To create an event you have two ways of doing it. One is to go to the Dashboard page and enter the name and description of the event in the ‘Create event’ tab. Another way is to go to the Calendar page, in the ‘Create event’ tab. In both cases if you click on the ‘Create event’ button now the event will be private and only visible to you in the calendar. 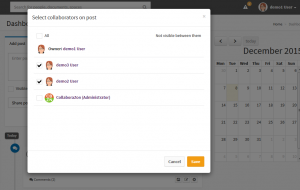 To share the event you can do it when creating it clicking on the ‘Share event with’ drop down list where you will see the list of your collaborators (including the CollaboraZon Administrator). 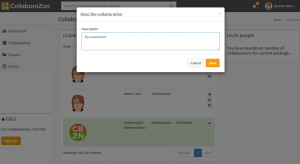 Tick the box next to the names of the collaborators to share and close the dropdown. Another option is to click the ‘Share event’ button on the event in the ‘List of events’ in the calendar page. 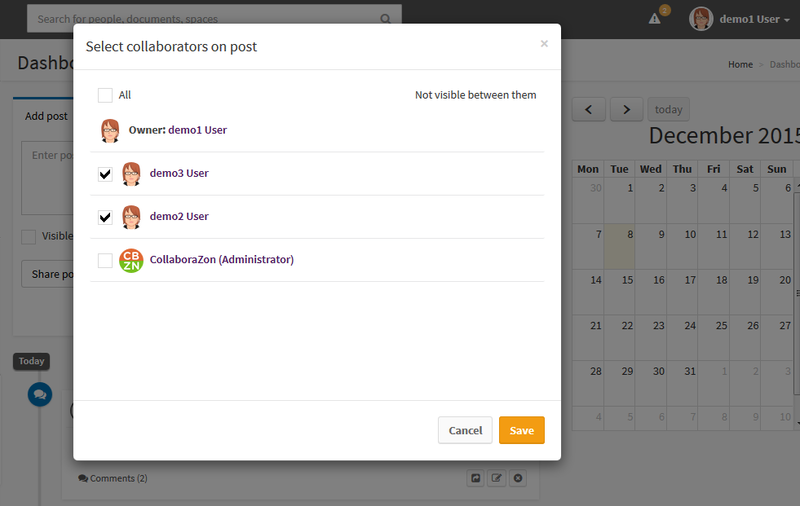 A modal window will appear with the list of your collaborators (those already collaborating will be already ticked). Sharing is only possible when you are the creator of the event. Visible between them: The collaborators will be able to see who else is attending the event. NOT Visible between them: The collaborators will NOT be able to see who else is attending the event. Only the creator of the event will see all the attendees. If you are the creator of an event you will be able to modify the details of the event by clicking on the button ‘Edit event’ on an event in the ‘List of events’ in the calendar page. You are able to remove the event as well by clicking the button ‘Delete event’. 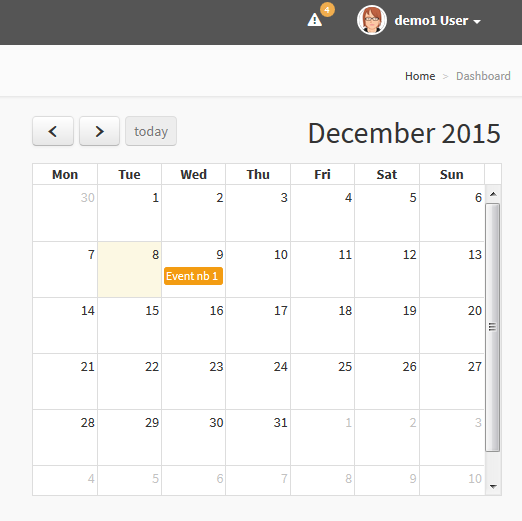 Events for the current month are shown in the calendar on the Dashboard page. 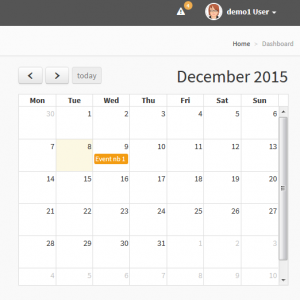 If you click on the event on the calendar a modal window will open with the details of the event. 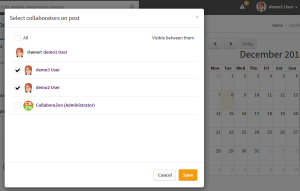 You can also go to the events page by clicking on the left menu option ‘Events’. You will be shown a calendar with all the events for the current Year/Month/Week/Day depending on the button pushed. In the right hand side panel you will see also the events as a list, and again you will be able to create a new one. In both cases you can navigate forward or backward in the calendar by clicking the ‘<‘ and ‘>’ buttons. The list of events can become long and finding the right one will be important if you need to attend. You can type a text in the ‘Search’ box on the top bar and the events containing the text will appear in the drop down results list. Click on one of the results and you will be redirected to the ‘Events list’ with the event highlighted. If many similar events appear you can also click on the ‘Return’ key on the keyboard or the magnifier icon and you will be redirected to a page with the list of similar results. Chose the right one and you will be redirected to the events list. You have a cloud drive space, limited by your subscription plan, which you can use to store files the same way you will do in your local hard drive. 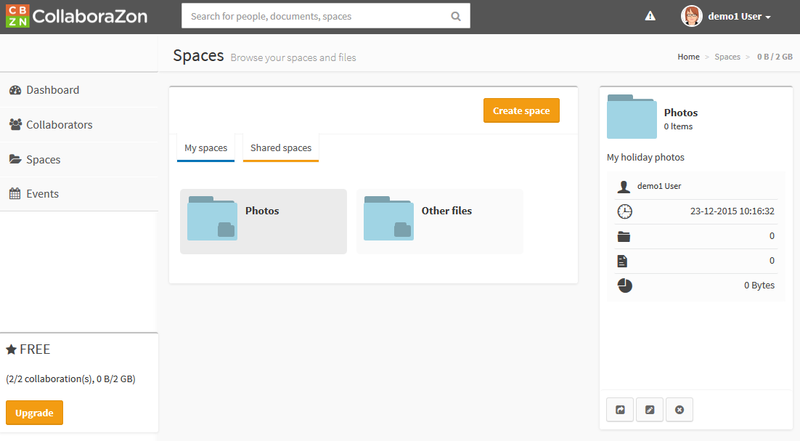 You can create Spaces (same as a folders) and upload files to those spaces. 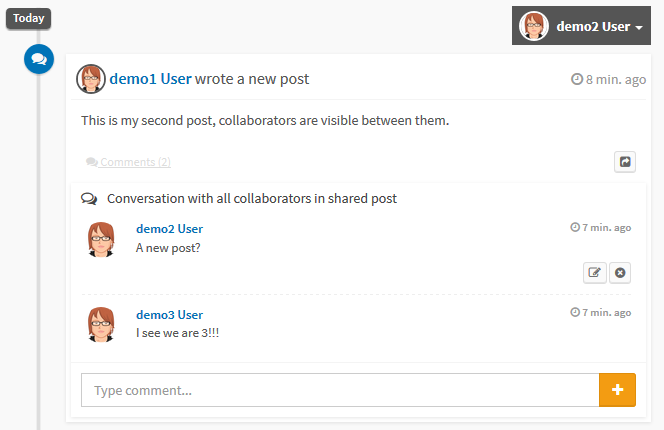 Spaces and files can be shared with collaborators the same way posts do. 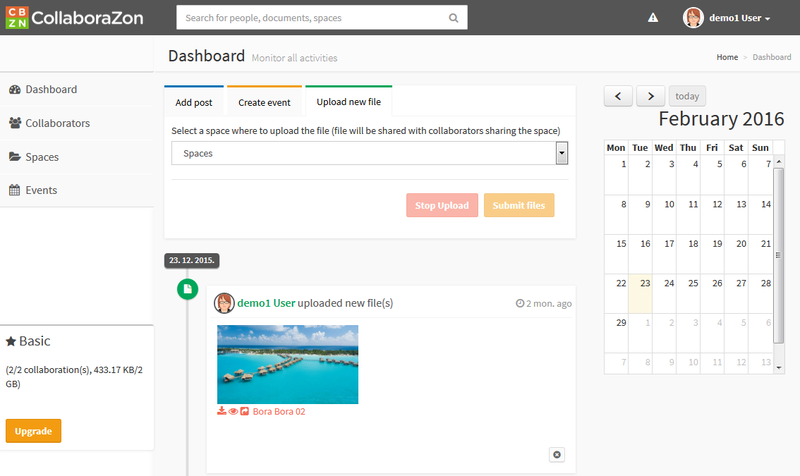 This allows the collaborators to consult your files or to upload new ones in your space when it’s shared with them. IMPORTANT: You will be billed by the drive space you use. If a collaborator uploads a file to one of your spaces, this file is stored in your drive space, thus you pay for it. To see your spaces click on the menu option ‘Spaces’ on the left menu. 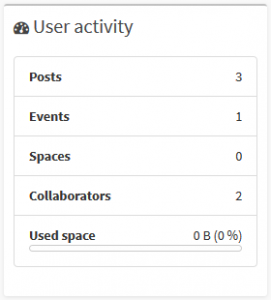 You will be redirected to the Spaces page where you will be able to select from a tab your spaces ‘My spaces’ or any of those shared with you by another collaborator ‘Shared spaces’. Once you select a tab you will see all the files and spaces contained. This spaces are the top-level spaces. Click on a space to see the details of that space at the right panel or double-click to navigate deeper inside the space. 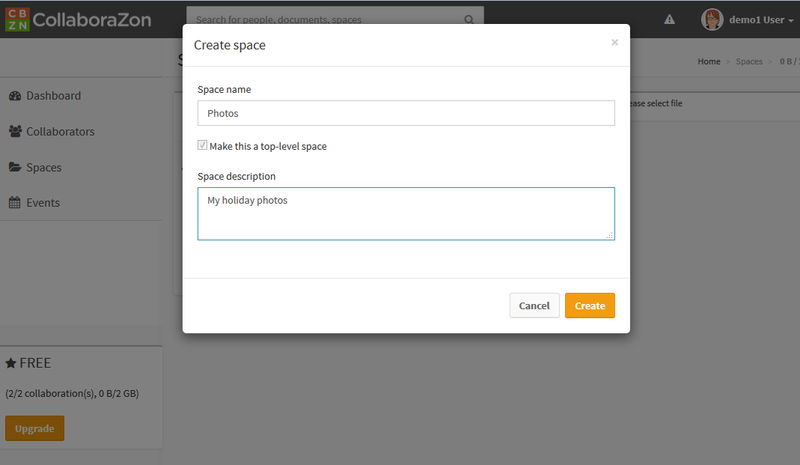 To create a space you have to click on the ‘Create space’ button. You have to give a name to the space and optionally a description, very useful if you want to explain what will be contained in it. There is also a check box ‘Make this a top-level space’, if ticked space will be created in the root of your drive space and will be accessible when clicking on the tab ‘My spaces’, if not ticked, the space will be created inside the current space as a subspace. Click on a space to see its details. They will be shown on the right of the screen. The buttons for the allowed actions on that space will also be shown. To share the space you can do it by clicking the ‘Share space’ button on the panel. 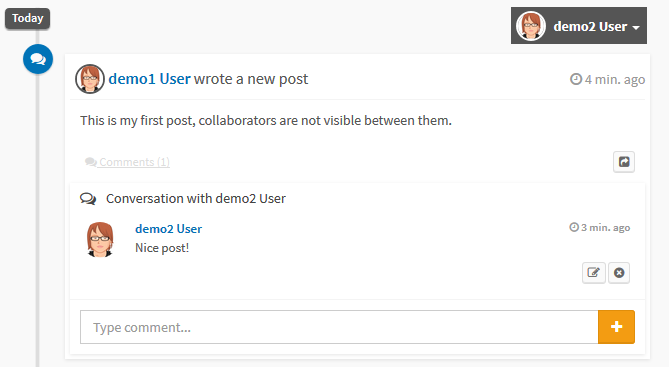 A modal window will appear with the list of your collaborators (those already collaborating will be already ticked). Sharing is only possible when you are the creator of the space. Visible between them: The collaborators will be able to see who else is sharing the space. NOT Visible between them: The collaborators will NOT be able to see who else is sharing the space. Only the creator of the space will see all the collaborators. 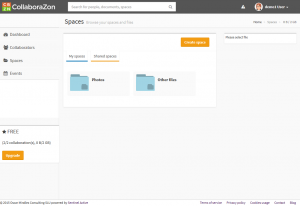 If you are the creator of a space you will be able to remove the space by clicking the button ‘Delete space’. Or rename it by clicking the button ‘Rename space’, which will allow you to edit the description too. By default a subspace has the same sharing as its parent space. But this sharing can be changed. 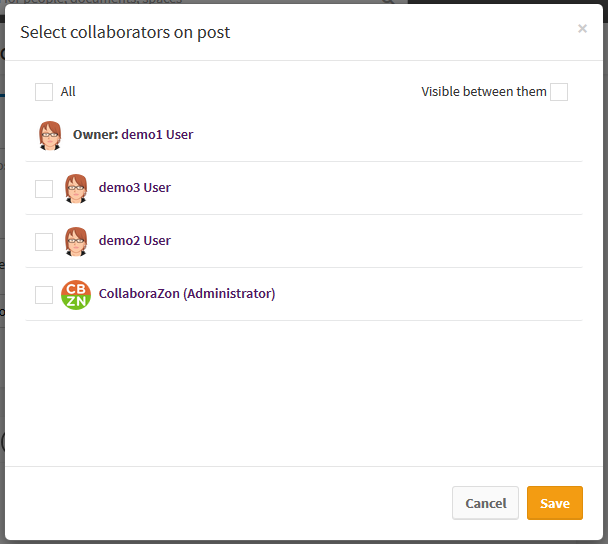 Click on the subspace, then click the ‘Share space’ button on the right panel and in the modal window with the list of collaborators (those already collaborating will be already ticked) remove a collaboration unticking the checkbox next to a name. You can not add new collaborators. This is done because it has no sense to see a subspace if the collaborator has no access to the parent space. To upload a file you have two ways of doing it. 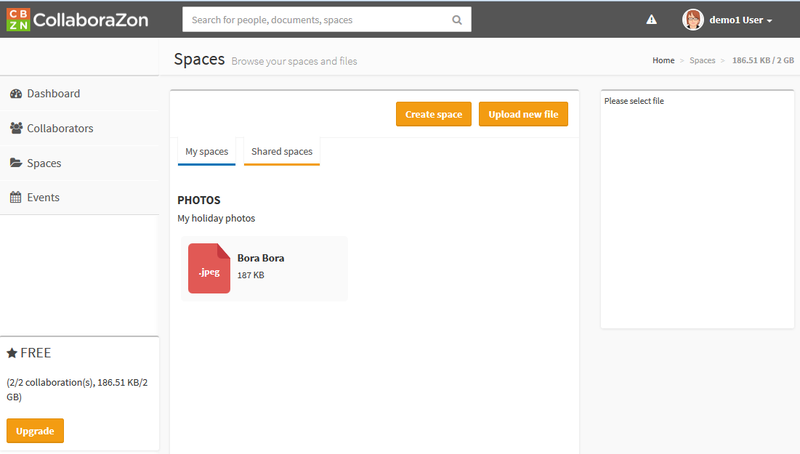 One is from the Dashboard page ‘Upload new file’ tab and the other is to go to the Spaces page. 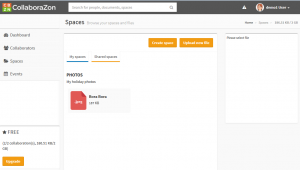 Furthermore, you can upload a file to your spaces or to spaces shared with you. 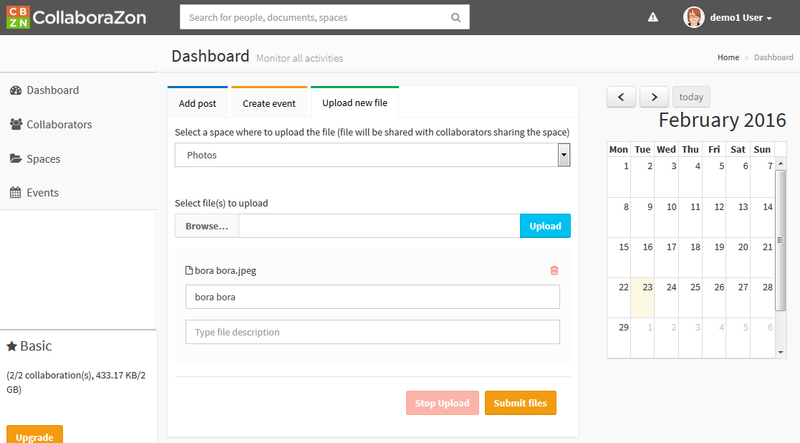 In the dashboard, at the ‘Upload new file’ tab, you will have to choose in which space the file will be stored from the dropdown list of spaces. You can then browse for the file in your local hard drive and then click ‘Upload’ button. The file will be transferred to our servers, then you will be able to give a name to the file (if not done, the filename will be shown) and a description, very useful if you want to explain what this file is. Sharing of the file is defaulted to the collaborators of the space selected. 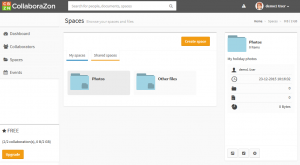 It is possible to upload more than one file at the same time, just browse for another file and click ‘Upload’ it will appear just beneath the previous one (limit for security is 20 files). Finally click on the ‘Submit files’ button to submit the file to the cloud. This will create a post automatically in your dashboard to show you that a file has been uploaded. 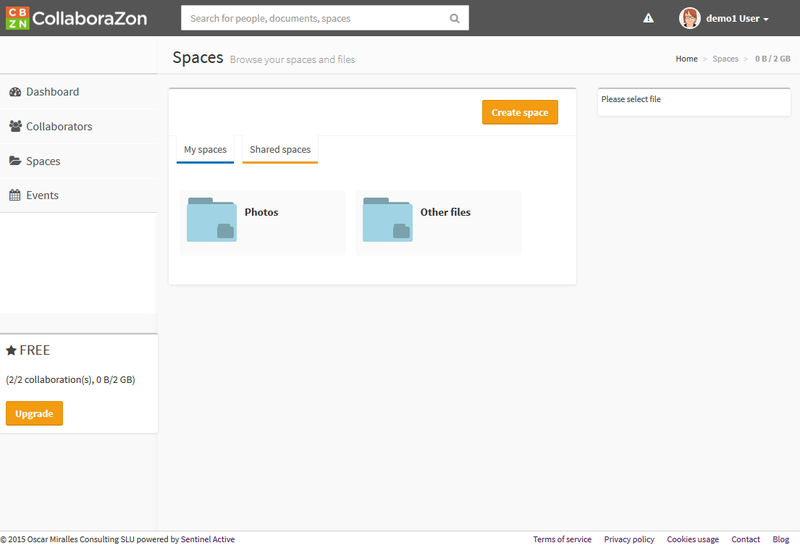 In the spaces page, to upload a file you have to click on the ‘Upload new file’ button when you are inside the desired space. You have to browse for the file in your local hard drive and then click ‘Upload’ button. Then you will be able to give a name to the file and a description. Finally click on the ‘Submit files’ button to submit the file to the cloud. 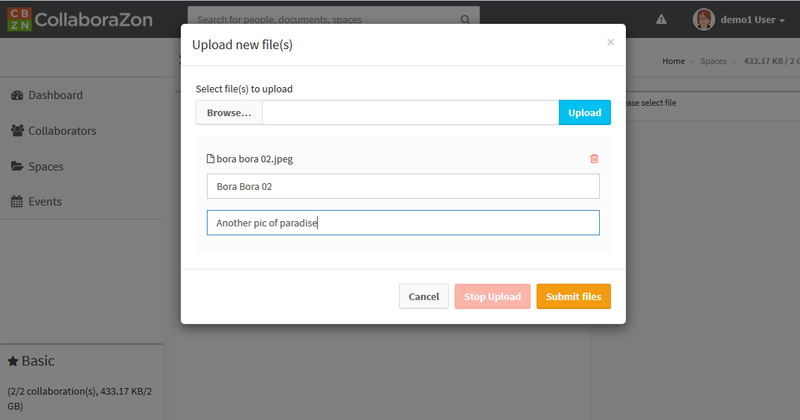 It is possible to upload more than one file at the same time, just browse for another file and click ‘Upload’ it will appear just beneath the previous one. IMPORTANT: Your drive space is limited by your subscription plan, if the file is too big for the spare drive space you have, you will not be able to upload it. Upgrade your plan to have more drive space. IMPORTANT: Others drive space is limited by their subscription plan, if the file you try to upload in others shared space is too big for the spare drive space he has, you will not be able to upload it. Ask him to upgrade his plan to have more drive space. Click on a file to see its details. They will be shown on the right of the screen. You will see also the buttons for the actions available for the file. And you will also see the history of versions of the file, with possibility to open the file or to download it. 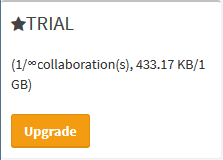 You will be able to upload a new version of the same file, by clicking on the button ‘Upload new version’, this version will become the latest version and shown in the space. By default a file has the same sharing as the space that contains it. 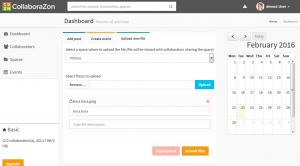 To share a file you can do it by clicking the ‘Share file’ button on the details. A modal window will appear with the list of collaborators from the parent space (those already collaborating will be already ticked). You can remove a collaboration unticking the checkbox next to a name, but you can not add new collaborators. This is done because it has no sense to see a file if the collaborator has no access to the containing space. Sharing is only possible when you are the owner of the file. Visible between them: The collaborators will be able to see who else is sharing the file. NOT Visible between them: The collaborators will NOT be able to see who else is sharing the file. Only the owner of the file will see all the collaborators. If you are the owner of the file you will be able to remove the file by clicking the button ‘Delete file’. All the versions of the file will be removed. Or rename it by clicking the button ‘Rename file’, which will allow you to edit also the description. The list of spaces and files can become long and finding the right one will be important if you need to work on a file. You can type a text in the ‘Search’ box on the top bar and the spaces and files containing the text in the name will appear in the drop down results list. The space containing the file is also shown, in case there are many files with the same name. Click on one of the results and you will be redirected to the spaces page showing the space or file searched. If many similar spaces or files appear you can also click on the ‘Return’ key on the keyboard and you will be redirected to a page with the list of similar results. Chose the right one and you will be redirected to the spaces page. 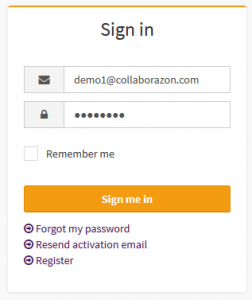 When you register at CollaboraZon you have a TRIAL subscription plan. 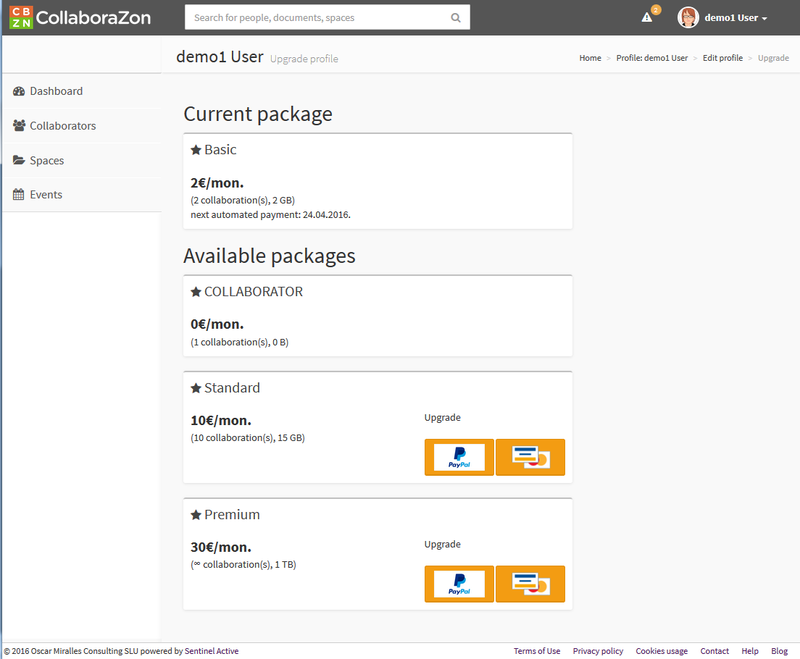 This allows you for 1 month of Trial and unlimited collaborations (collaboration with CollaboraZon Administrator is not counted) and limited to 1GB disk space in the cloud. After this period, if no upgrade has been done, your account will be changed to COLLABORATOR plan. 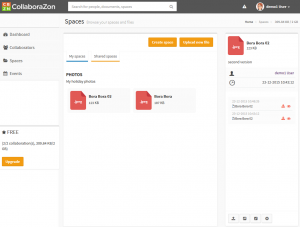 this allows you to keep your collaborations and files but no more disk space, so you will not be able to store any new file in your own space. 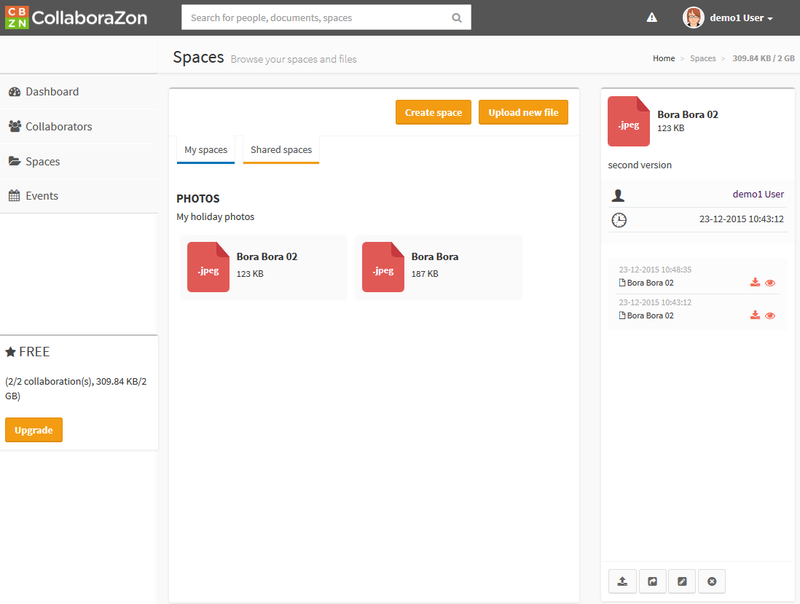 If you want to enjoy of more collaborations and more disk space where to store all your documents you will have to upgrade to a more professional subscription type. To do it you can click on the button ‘Upgrade’ on your current subscription box in each page. or going to your profile page an editing your profile. Once you click you will be redirected to the packages list. Chose the most suitable package from the list and click on the ‘Upgrade’ or ‘Downgrade’ button. Only available packages will have a button next to it. You can not downgrade to a lower plan if you have more collaborators than the ones allowed in the lower plan; same if you have used more disk space than the one allowed in the lower plan. 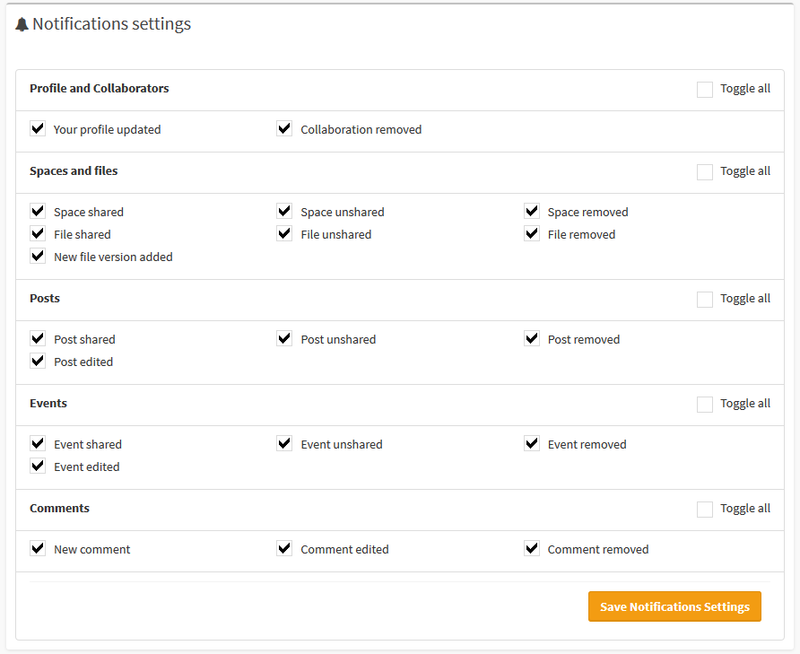 Remove collaborations and documents if you finally decide that you want to downgrade. Clicking on the ‘Upgrade’ or ‘Downgrade’ button will send you to the payment platform where you will introduce your details and then recurring payment will be installed. Once the payment is processed correctly the new plan will be assigned to your user and you will benefit of the new available collaborations and disk space. You can upgrade/downgrade at any time, the new plan will be charged from the day you change, but you will not be refunded for the current period.